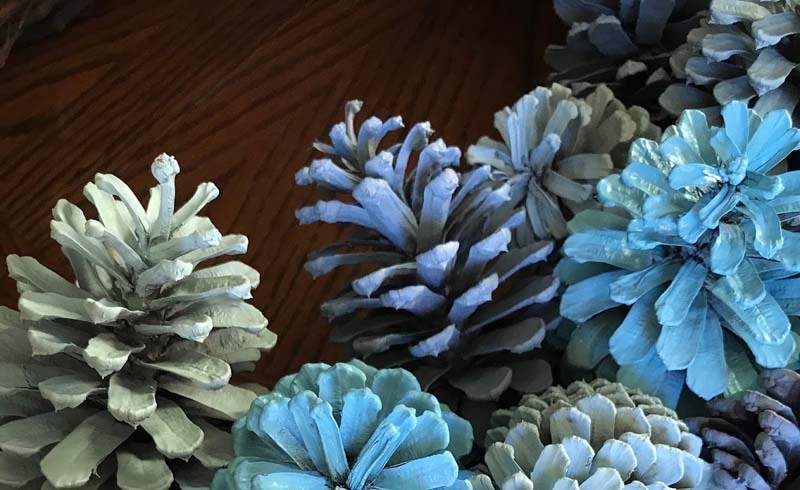 Make a pretty pinecone wreath for the holidays (or any time of year!) with an inexpensive grapevine wreath, spray paint, and a few other basic craft supplies. Don't drop big bucks on a fancy Christmas wreath. This DIY pinecone wreath costs little to make but leaves a big style impact. All you need is pinecones, spray paint, and a basic wreath form to upgrade. 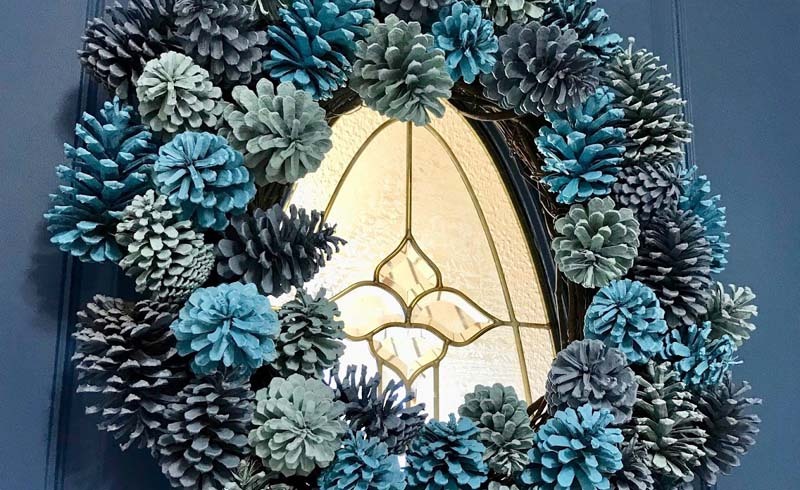 We chose a blue color scheme for our wreath, but you can use any colors you like. For an ombre look, stick to hues within the same color family. We used three shades of blue as well as silver for a pop of shimmery metallic. You can also create a monochromatic wreath or alternate colors (such as red and green) for a two-tone wreath. Before you begin crafting your DIY pinecone wreath, gather all your materials. Dust off any debris if you're using real pinecones, or remove faux pinecones from packaging. Lay down a drop cloth to protect your surface. Then, in a well-ventilated area, spray a coat of primer on the pinecones. Let dry. Once dry, spray the primed pinecones with your desired colors. To achieve an ombre effect, you'll need to use paints within a few shades of each other. For example, we used a mix of blues with small pops of silver. Let pinecones dry. Safety Tip: Always use spray paint outside or in a well-ventilated area. Wear a protective mask and gloves, and cover any surrounding surfaces in the way of the spray paint drift. Heat up your hot-glue gun. When the glue is pliable, begin attaching pinecones to the wreath frame. Glue on the darkest pinecones first, then work your way up to the lightest pinecones. Let the glue dry and hang. Editor's Tip: To make your wreath last longer, consider using floral wire to attach the pinecones to your DIY wreath after placing with glue. This will prevent the pinecones from falling off in extreme weather conditions.